and incline the ear of your heart." The journey to living a monastic manner of life begins within the heart of each future monk. He may become aware of these first interior movements while reading works written by monastic authors, or while searching for spiritual topics the Internet. He may experience a strong sense of connection on a visit to a monastery of monks or nuns. Whatever initially piques his interest sooner or later moves him on to further investigation, inquiry, and discernment as he prayerfully seeks out the path on which God has chosen for him to walk. The monastic journey at Saint Gregory Monastery begins at the feet of the inquirer who makes his first appointment to meet with the Superior of the community. Very often this appointment takes place while spending a weekend in the guest house on a private retreat. Before making this initial visit, the inquirer familiarizes himself with all the information provided on this website. After several weekend visits to the Monastery, the inquirer expresses his intent to enter. If the Superior encourages his desire, the inquirer becomes informally known as a "Candidate" and is expected to make regular visits to the monastery while maintaining contact with the Superior. The Candidate may be invited to spend a more extended time--a few weeks or a month--residing on the monastery grounds outside the enclosure, perhaps housed with other Candidates who are also preparing to enter the monastery. The decision to cross the threshold of the monastic enclosure and begin monastic formation is a mutual decision between the Superior and the Candidate. Candidates should be between the ages of 25 and 35, free of any obligations to family or any other person (no unpaid debts or dependents). The Candidate must be able to terminate employment and dispose of his previous housing situation. He will have to delete personal Internet accounts and abandon the use of mobile communication devices, and be prepared (even at a later date) to surrender any hold he may have on property and other personal financial resources. Postulancy. "Postulant" comes from the Latin "postulare" which means "to ask." Postulancy is the beginning level of monastic formation. For six to nine months, the Postulant resides in the Novitiate while studying Latin and Gregorian Chant, receiving instruction from the Catechism of the Catholic Church, and listening to weekly conferences from the Superior and/or Novice Master on the Rule of Saint Benedict. The Postulant dresses in a black hooded smock, black twill trousers, and black shoes for the liturgy, meals, and classes. For work and recreational activities, he wears a gray smock with suitable trousers and shoes (all novices and monks wear a hooded work smock when appropriate). If it is apparent that he is growing from the experience and adjusting well into this environment, he will be invited to formally apply for admission to the Novitiate. Novitiate. Canon law requires at least one uninterrupted year of formation before pronouncing religious vows. It is now common for contemplative communities to require two years of formation in the novice state before professing temporary vows. In a private "Rite of Reception," the Novice is clothed in the black monastic tunic and a grey cincture and hooded scapular and given his monastic name. The Novice's studies will focus on the essentials of monastic life: the liturgy (Holy Eucharist and Liturgy of the Hours), The Holy Rule of Saint Benedict, Monastic History, Consitution of the congregation, and Book of Customs. A few hours of domestic chores and other kinds of manual labor are assigned to the novices, taking care not to burden them with any important responsibilities in the monastery. Contact with guests and outsiders is curtailed and visits from family and friends are limited to four times within a year. As novitiate draws to a close, the Novice is invited to petition the Superior to pronounce temporary vows. Juniorate. 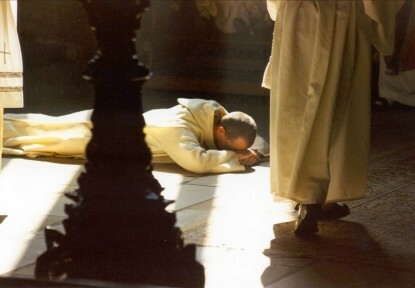 The first profession of vows is the first "public" act in which the new monk expresses his commitment to his cloistered life of prayer and work under a superior and within a community of brothers. The "triennial" (three-year) vows are pronounced during a festive Mass in the presence of immediate family and selected friends. The vows are written in his own hand and signed on the altar. He is dressed in the black hooded scapular of the professed monk and girded with a black leather cincture. His many years as a monk of Saint Gregory Monastery has officially begun! The Internet makes it possible for a junior monk to engage in limited theological studies without interrupting his life of worship, prayer, and assigned work within the monastic environment. During this time his responsibilities within the community's workforce will be developed. Solemn Vows. More than five years have passed since the monk first walked into the cloister as a Postulant. What may have first appeared as a long road to this day is now, in hindsight, a brisk walk up a small slope. The pronouncement of Solemn Perpetual Vows today is a proclamation of what has lived in the heart of the monk since he pronounced his vows for the first time three years earlier. Today the monastery church is filled with family and friends. After reading and signing his petition of vows, the now senior monk stands before the altar and solemnly intones, "Sustain me, O Lord, according to your promise and I shall live, let my hope in you not be in vain!" and is then clothed in the "Cowl" or "Cuccula": a full hooded garment worn by solemnly professed monks at Mass and the major hours of the Divine Office. On-Going Formation. Once the years of formal formation have ended, the monk embarks on a life-long journey of learning and growing in the Lord. He may continue his "distance" studies of Theology, perhaps toward a degree, and there will be frequent conferences given by the Superior and by retreat masters. Workshops and instructional opportunities may be provided by guest priests or other lecturers. Future study may include subject areas other than theology and monasticism, as required by his work in the community. Preparation for the Sacrament of Holy Orders is offered to a few monks whom the Superior has deemed suitable to serve the community as priests. All monks would agree that the most valuable formation program is provided in the daily interactions of community life, and in the collective wisdom of brother monks who share in the humility and sacrificial fraternal charity. Although only one monk can hold the place of Abbot in the monastery, all monks are called to become "abbas" to one another.